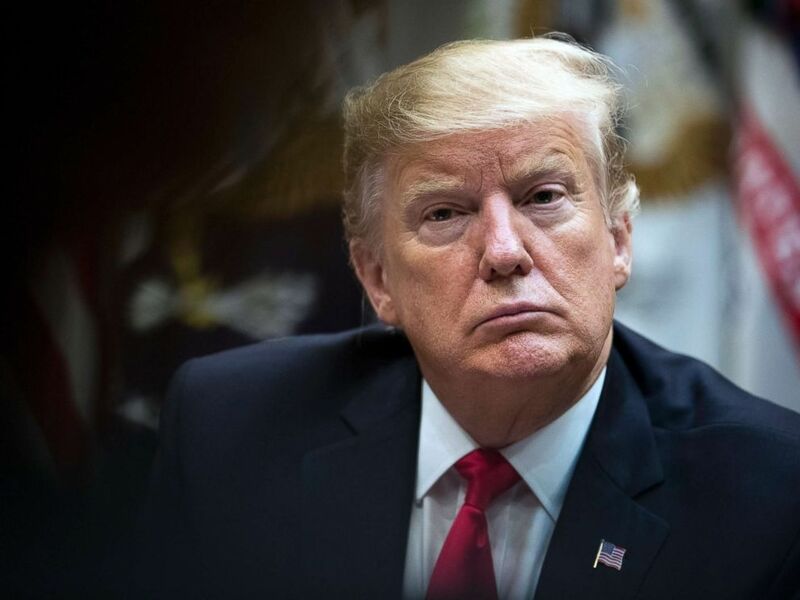 President Donald Trump accepted House Speaker Nancy Pelosi's invitation to deliver the State of the Union address next Tuesday – bringing to a likely close a tense chapter between the two leaders. "It is my great honor to accept," Trump wrote Pelosi. "We have a great story to tell and yet, great goals to achieve." In her invitation to Trump, Pelosi wrote that she had previously hoped the two leaders would "work together to find a mutually agreeable date when government has reopened to schedule this year’s State of the Union address." After extending an initial invitation on Jan. 3 asking the president to deliver the State of the Union on Jan. 29, Pelosi eventually rescinded the invitation amid the government shutdown, urging Trump to delay his annual address until the partial government shutdown ended. 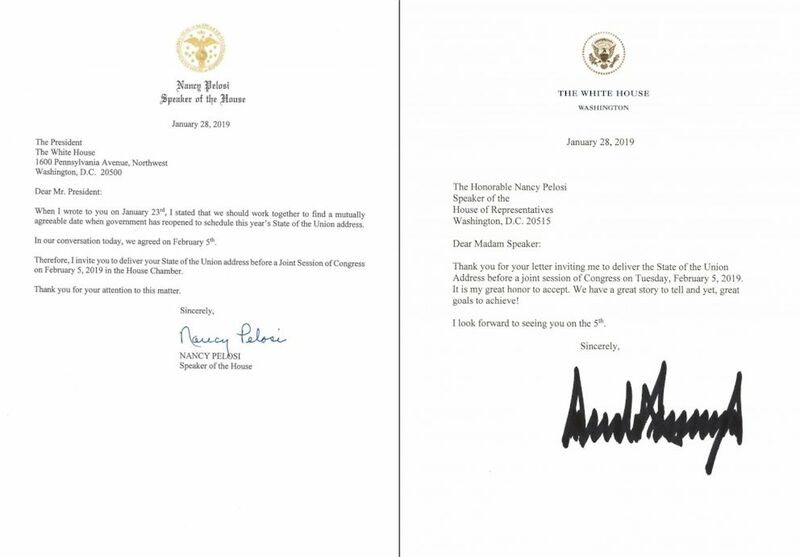 A source told ABC News that Trump and Pelosi spoke at 3:55 p.m.
A combination of two images shows Speaker Nancy Pelosi's letter to President Trump inviting him to deliver his State of the Union address in the House Chamber on Feb. 5, 2019 and President Trump's response, accepting the invitation, Jan. 28, 2019. The longest-ever government shutdown is over but federal employees who returned to work Monday face the possibility of another one in just 19 days, unless congressional negotiators can find a politically acceptable solution. Political parties in both chambers have appointed lawmakers to a new bipartisan 17-member conference committee on border security, which was called for as part of the "deal" announced Friday. The panel won’t hold its first meeting until Wednesday -- so, there’s essentially just 17 days on the clock to generate an agreement that could avoid another shutdown. After meeting Wednesday -- when lawmakers are expected to do little beyond exchange introductions -- Congress will recess until next Tuesday, illustrating how quickly a congressional calendar can evaporate and deadlines that seem far off can sneak up on Capitol Hill. The burning question inside the Capitol as lawmakers returned to work Monday was whether there's any room for a compromise on the central question in any immigration deal: President Donald Trump's proposed border wall. At this stage, even with a new deadline looming, both sides appear to remain at the same impasse that led to the record-breaking 35-day shutdown. Basking in the glory of her first major legislative victory since reclaiming the speaker’s gavel, House Speaker Nancy Pelosi told reporters she has “no complaint” about the length of the negotiating period -- but she also showed no sign of backing off Democratic resistance to any new physical barriers along the border. Majority approval -- separately from both the House and Senate -- is needed to advance a conference report to a full vote in the House and Senate. While Republican senators hold a 4-3 advantage in the upper chamber, Democrats hold a 6-4 edge in the House -- putting the prospects of a border wall out of reach in these negotiations. By ending the shutdown, Trump ostensibly signaled a reluctance to shut down the government again. But when the president announced an agreement to reopen the government on Friday, he again threatened to exercise executive power to declare a national emergency at the border and redirect funding from other projects to construction of a physical barrier -- if negotiators fail to strike an agreement. While some Republicans are urging Trump to accept a compromise with less than $5.7 billion for the wall, Democrats remain steadfast in their insistence that no money is appropriated for construction of a physical barrier in areas where there's currently no walls or fencing. Over the weekend, acting White House chief of staff Mick Mulvaney convened a weekend retreat with six Republican senators at Camp David, Maryland. Two GOP sources said that the president also phoned into the meeting. A source familiar with the retreat said that Republicans and the president could strive to expand the discussions into a “larger negotiation” – closer to the four pillars of immigration reform that the president sought a year ago. A Democratic aide, however, said the scope of conference committee's negotiations will be focused on funding, "not adding complex immigration issues," such as chain migration or DACA. "The preference is to produce an appropriations product and the general consensus is to complete work on funding issues only," the aide said. "The general sense is that expanding the scope of the conference committee would complicate negotiations to the extent it is probably not helpful." Democrats have expressed a willingness to beef up border security, even rebuilding physical barriers in areas they already exist – but have drawn the line at extending the wall in new areas. The conference report is also likely to include an omnibus -- funding the six areas of appropriations beyond homeland security before the Feb. 15 deadline to avert another partial government shutdown. Trump told the Wall Street Journal that he’s pessimistic the conference committee will produce a deal he could support, placing the odds at “less than 50-50” while adding that he doubts he could accept less than $5.7 billion for new border wall. ABC News' Jonathan Karl contributed to this report.